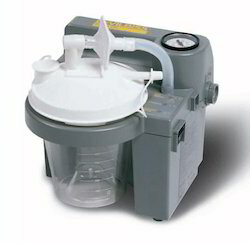 Wholesale Supplier of a wide range of products which include suction unit. Leveraging on wide expertise, we are instrumental in offering best quality Suction Unit. owing to our strict quality control policies we are able to source the most trusted device confirming the stringent specifications of ISO 10079-1 standard. Featuring a remarkable suction performance the offered model is widely preferred for its low noise levels and durability. Designed with a vacuum range of 80 - 550 mmHg the offered unit is the most effective airway suctioning device which we have procured from industry leading vendors. Further, the high performing model is accessible from us at a nominal price. a flow range of 0 - 27 l/min. mains lead and carry case. 100 V - 240 V.
Has an integrated bacterial filter.